● ● ● SEPTEMBER 2018 • FOODSERVICE EQUIPMENT & SUPPLIES • 65 Instead of risking a slow decline, the management team decided to redesign. The goal was to once again become a fun, cool place to hang out, says Rotolo Sr. "We were either going to age out of the segment and not compete any more or we were going to reevaluate the interior and the menu, grow with the segment and really cater to the Millennials along with the generation that grew up with us." Back to the Bar The return to the concept's roots started with a front-of- the-house overhaul. 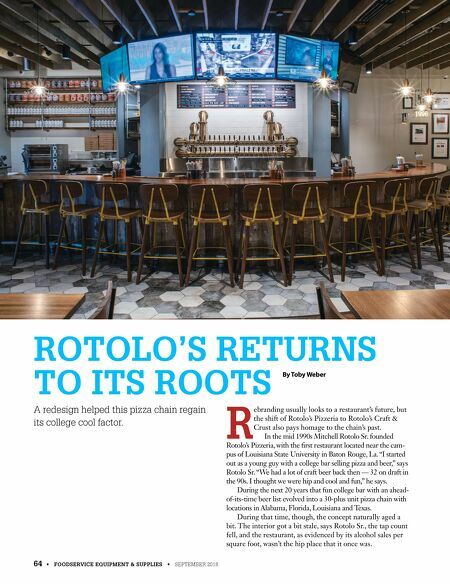 To enhance the atmosphere, Rotolo's Craft & Crust's leadership decided to make the space more comfortable, and more beer focused. "We're not bringing people a check as soon as they finish their lunch or dinner," says Rotolo Sr. "They're really hang- ing out more and it shows in the alcohol sales per [square] foot, which are higher than our regular locations, so we've met our mark there. We're also getting more frequency from our guests, so our traffic has gone up." Producing these results started with the restaurant's floorplan, particularly the bar. While still family-friendly, the bar at Rotolo's Craft & Crust sits in the front of the restaurant, making it the first thing guests see when they enter. This move provides a more energetic ambience that encourages guests to hang out and have one more drink after finishing their meals, Rotolo Sr. says. Supporting its goal of going back to its 90s roots, the chain also enhanced its beer package. Locations now offer 40 beers on tap — mostly craft brews from around the country — featured in a custom tap tower. Staff store kegs directly behind the bar in a refrigerated cage. While the restaurant relies on direct draw from the kegs, it also uses a glycol system that keeps beer in the lines cold and helps ensure a quality pour. The company also invested significantly in the appear- ance of the bar itself. In the prototype Rotolo's Craft & Crust location, the bar top was made from a 500-year old sunken cypress stump pulled out of a Louisiana swamp, while the bar face was made of bark from the same tree. The quasi-patio space inside the restaurant represents another big layout change in the new Rotolo's Craft & Crust. Like the bar, this space encourages guests to linger. Sitting at the restaurant's storefront, but to the side of the entrance, this area has large bifold windows that open when weather allows. Sets of bifold doors separate the patio space from the rest of the dining room. When open, they give the entire restaurant a more natu- ral ambience; when closed, it allows the patio to serve as a private event space. The rest of the design mixes warm materials with slightly industrial ele- ments. Rotolo's Craft & Crust uses hardwood throughout the restaurant, including booths, chairs and tables, and exposed ceiling beams. Industrial elements prevent the design from sliding toward too-cozy- to-be-hip territory. Elements include brick walls with hand- painted murals and storage cages in the dining room where canned goods and retail items like T-shirts are held. chain profile ● Key Players: Mitch Rotolo Sr., founder and CEO; Ryan Brach, chief operating officer; Christina Bourg, senior vice president; Mitchell Rotolo Jr., director of research and development ● Interior Designer: Ali DeBosier, Domain Architecture ● Kitchen Design: Mitchell Rotolo Sr., Mitchell Rotolo Jr. ROTOLO'S AT A GLANCE Top right: The chain's new interior design is a mix of warm woods with slightly industrial elements, like a brick mural wall and a cage in the dining room that's used for storage. Bottom right: The chain's redesign included a facelift to its facade that gives lo- cations more curb appeal. Opposite: The bar is the fo- cal point of Rotolo's Craft & Crust. 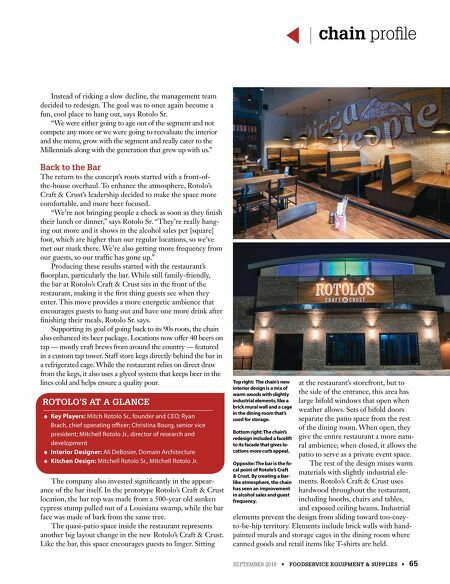 By creating a bar- like atmosphere, the chain has seen an improvement in alcohol sales and guest frequency.